I've been an extreme weather junkie since I was a kid. Where I grew up in Mississippi, there were tornadoes and hurricanes. Maine doesn't have such violent storms, but we do have our own extreme weather, the cold. It seems like the first two weeks of January feature a below-zero cold snap every year. I was at Five Islands for this occurence two years ago, and witnessed my first sea smoke. Last year we went big at Portland Head Light and got some great images, one that is now a 8x9 foot mural at the new Berlin City Honda in South Portland. There was a lot of pressure to build on those experiences and go even bigger this year. Rockland is a place I love to visit. 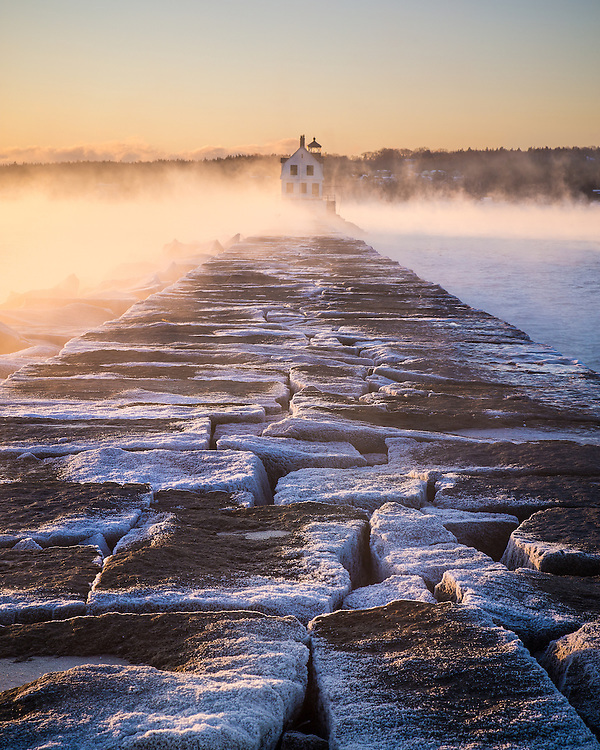 It's a little far away at over an hour east on Route 1, but I don't have a lot of images from here and there are two fantastic targets I wanted to shoot with sea smoke, the Breakwater Lighthouse and Owls Head Harbor. The date was set and come 4 AM Thursday Morning, we were on the road. It was dark when we arrived, but already we could see the mist pouring off the water. I had about 5 layers of clothing on, including some new mittens that really worked wonders saving my fingers from frostbite later on. It didn't feel like a very long time, but apparently I stood out there in the cold for about two hours. I was so determined to get my shot that everything else kind of faded away. It was a sublime two hours. So, this is the frame I had in mind when I went out. As usual, several other possibilities presented themselves while I was out there, and the vortex over Owls Head has to be the shot that I will come away being happiest with. This was taken just after that. I took off the gloves and grabbed the extremely cold metal lenses with my barehands to change them and get the right focal length for this wide-angle shot taken just as the sun made it over the plumes of sea smoke on the horizon. You can see the hoar frost that formed on the rocks as the mist crept between them. It was beautiful.